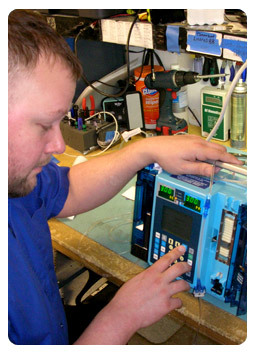 Our quality assurance process includes three audits, as well as various checks that are performed specific to each type and model of equipment using a special testing device. Every piece of equipment that leaves our facilities have been inspected to establish that it meets or exceeds all manufacturer specifications and is ready for patient use. Our Biomedical Department services thousands of pieces of pre-owned equipment each year from our regional offices across the United States. Ardus Medical's trained biomedical technicians will ensure your critical care equipment remains in patient-ready status. All equipment that leaves our facility leaves in "Patient Ready" status. This means that the equipment has been tested, meets or exceeds all manufacturer specifications, and is ready for patient use. The equipment is tested on a device that performs various checks specific to each equipment type and model. Hard-copy documentation is included with each piece of equipment shipped, and we retain a copy on disk for device history purposes. In the event of equipment malfunction, we include warranties for all patient-ready equipment that cover all parts and labor for the agreed-upon warranty period. For a nominal fee, extended warranties can also be purchased. To discover how much you can save on your medical equipment repair, medical equipment service, PM or medical equipment maintenance call today at 1-855-59-Ardus ! See our Quality testing process!